If you want to remove all permissions to contact support for your account, you can revoke the support passphrase. This does not affect the billing account contact. They will still be able to contact support without a passphrase. 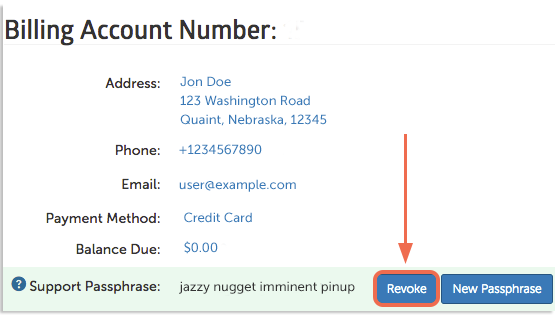 Follow these steps to revoke your account’s passphrase. Please note that once a passphrase has been revoked, that specific passphrase cannot be reset to its original value. You can still generate a new passphrase, but the passphrase cannot be rolled back to previous passphrases. The passphrase feature will be turned off and no one will be able to access our support team or authorize changes besides the billing account contact. You can turn the passphrase feature back on at any point, but a new passphrase will be generated and will need to be given out.